Note that all the photos shown were provided by the dive shop. I arranged my cenote dive with Motmot Dive shop the day before. I spoke with the dive guide, Scott, and got the feel of what I was to expect on the dive. If I was lucky and no one showed up for tomorrow's dive, I would have a one-on-one dive with Scott. Incidentally, Motmot is a type of bird that is often found at the entrances of cenotes and it's how the Mayans typically discovered new cenotes. When I showed up in the morning, I got the good news that it was only going to be Scott and I that were going to dive. Good. I was little rusty in my diving skills, not having gone diving in two years. I needed all the one-on-one experience I could get. 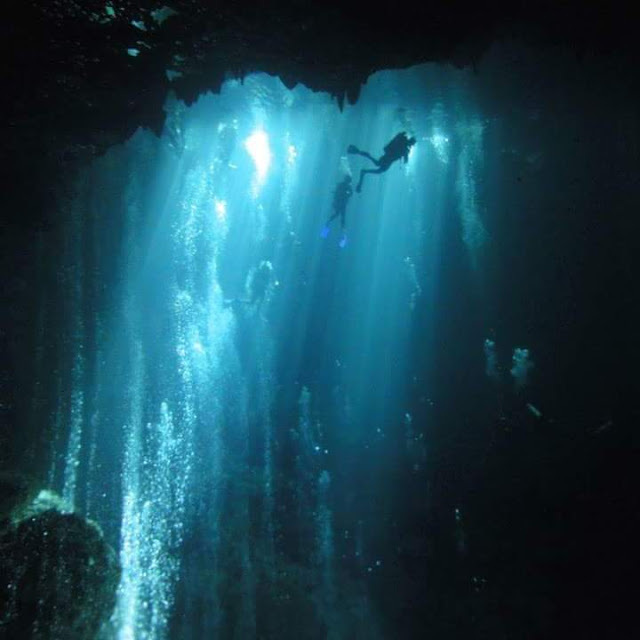 After getting outfitted with my diving gear we drove to the Dos Ojos (two eyes) cenote. 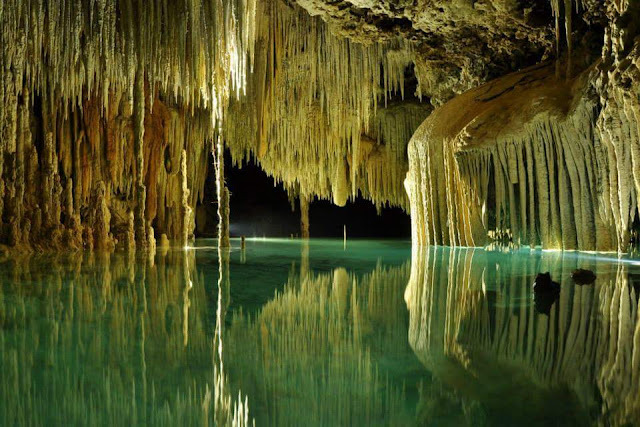 For those who don't know what a cenote is, in the Yucatan, cenotes are typically underground freshwater pools made of limestone. 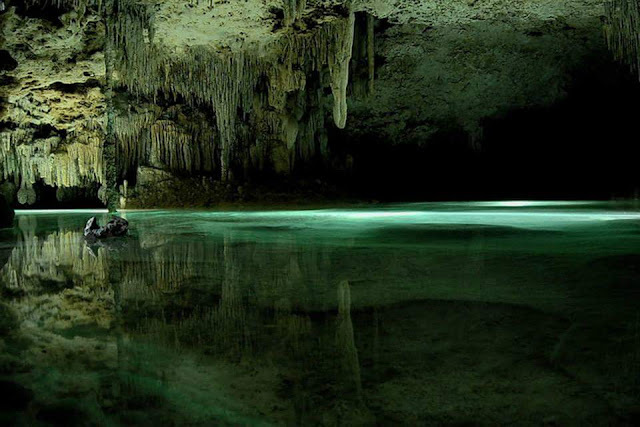 Some are open water pools while others are enclosed, more like caves. Dos Ojos is surrounded with dense jungle vegetation with a partially enclosed cave. Some of the above ground tree roots penetrated the roofs of the cave system. It looked like a perfect background for a Spielberg Jurassic Park movie. Roots coming through the roof. 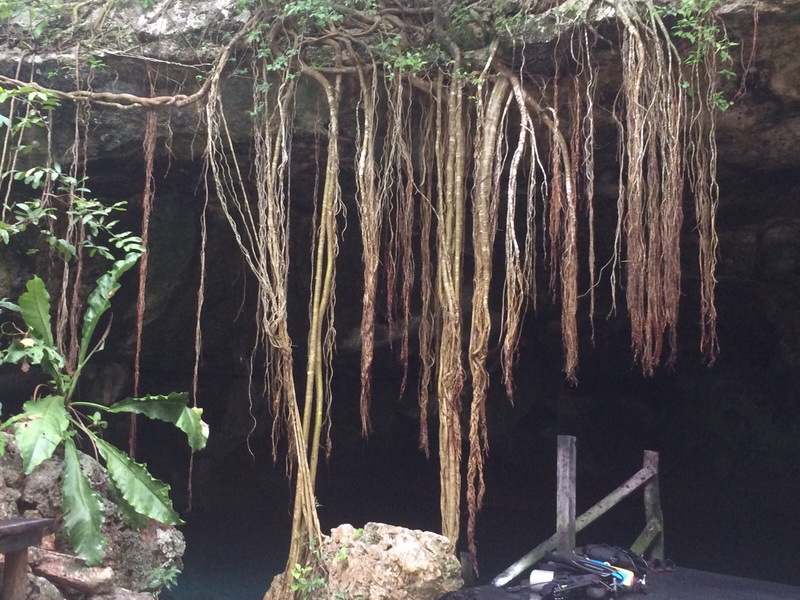 After looking around the area, Scott meticulously went through the rules and regulations of diving a cenote. 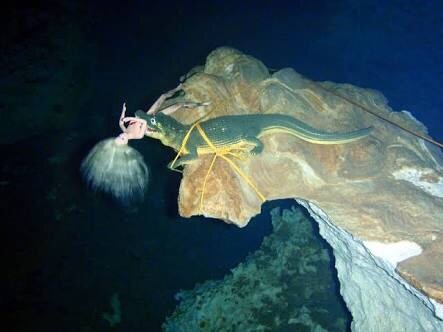 It's a little different diving a cave than diving open waters. Dos Ojos has numerous veins that stretch for nearly one hundred miles. So not following the guidelines could get one into serious difficulties. The difference in diving a cenote versus open water diving are such things as the way you kick - you don't kick up and down because that stirs up the soft bottom. Instead, you use the kick of the breast stroke and kick horizontally. Also, there is a bright yellow line stretched along the diving path. 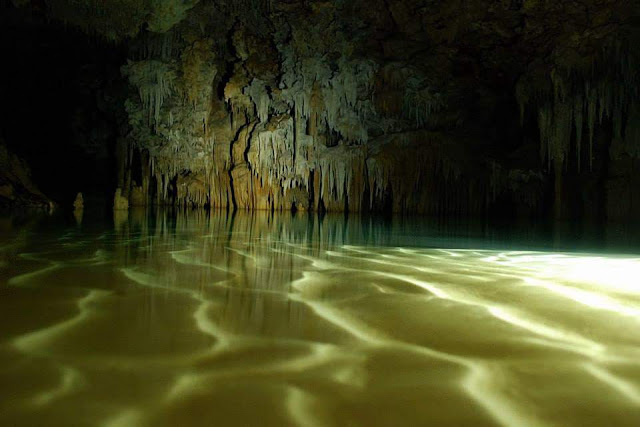 You try to avoid touching the line as well as the limestone formations, the stalagmites and the stalactites. One of the other rules pertains to oxygen utilization. When you are half way into the dive, you should have two-thirds of your oxygen remaining, leaving another third to exit. The last third is there only for emergencies. Thus, in most cases you come out with a third of you tank unused. 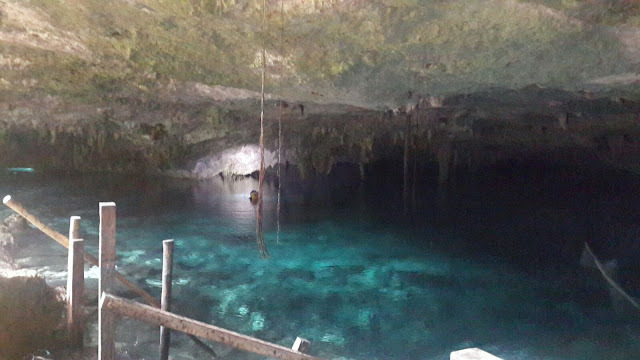 After getting suited up, we walked down the steps to the cavernous entrance of the cenote, weighted down by all the gear. After one last briefing, we jumped in, got our flashlights on and checked our buoyancy. Initially, I had trouble staying down, so Scott gave me an extra two pound weight, and off we went. 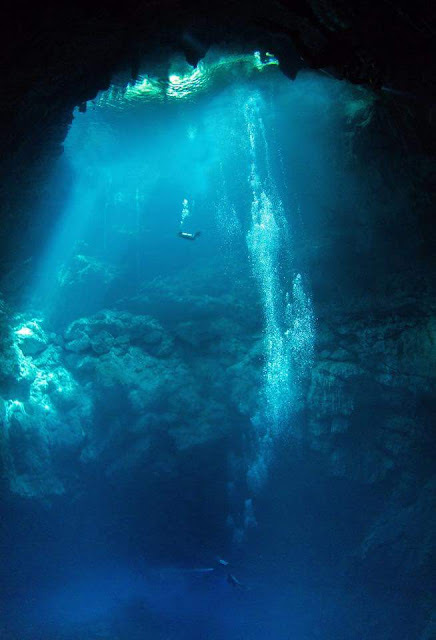 I must admit that in spite of having done numerous dives for over 35 years, my initial comfort level gave way to a very claustrophobic and somewhat unnerving feeling. I felt closed in and it seemed that I was using up more oxygen than I normally do in a dive. I was very uncomfortable - to the point that I wasn't sure I'd do the second dive. It was the deeper and darker dive of the two dives. 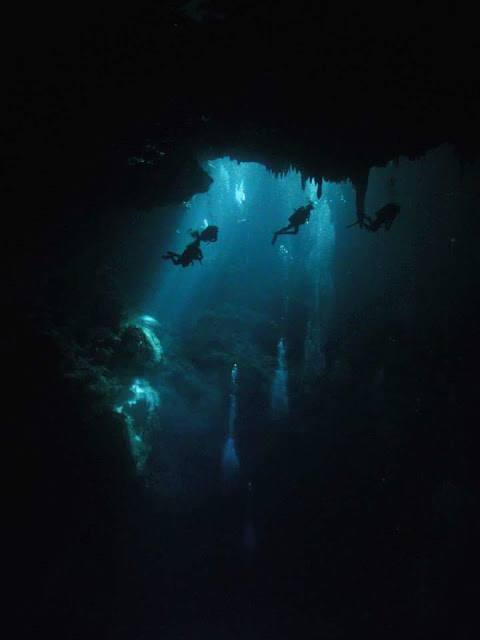 Divers approaching the entrance to the cenote. The surroundings were familiar, in that I had seen a number of caves with stalagmites and stalactites, except that these were all under water. They were quite impressive, knowing that it takes a stalagmite one hundred years to grow one centimeter. My the time we got to the halfway point (marked by a plastic alligator with a Barbie Doll in its mouth), Scott checked in on me to see how much air I had left. I was pleasantly surprised to find that I had well over two-thirds left. Knowing that, I felt much more at ease and enjoyed the second half of the dive. 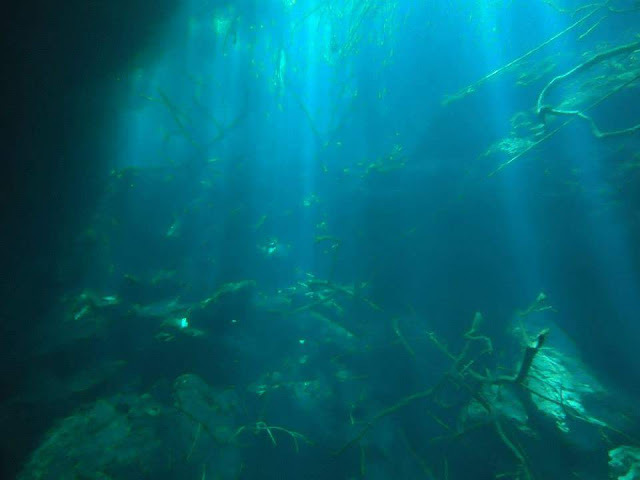 There was a slight current in that part of the cenote that gave us a chance to drift along a bit. The second dive was bit deeper (still shallow in terms of open water dives) with more areas of total darkness. The flashlights were a necessity. 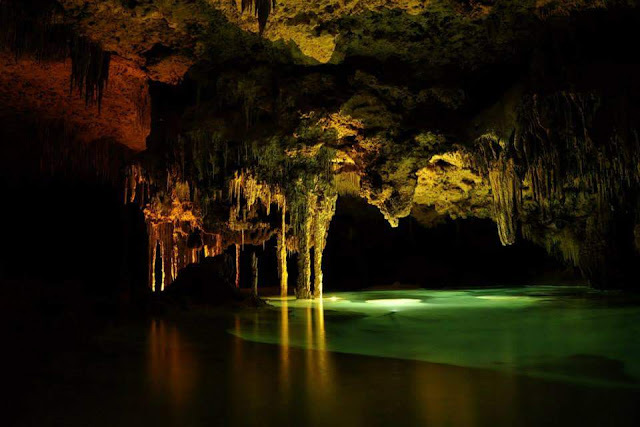 The stalagmites and the stalactites were massive, some looking like columns of melted was candles. We also spotted sea fossils and the roots of trees growing above ground that had penetrated the underwater cavern. Midway, Scott gave the signal to surface. We had arrived in the Bat Cave. With the BC inflated, we could relax and watch the dozens of bat families hanging from the craggy ceiling of the cave. Every now and then a bat would fly around and land in another spot by swinging its feet upside down to latch onto the ceiling. It was quite a sight to see. In most areas the water is crystal clear. Stalactites reaching towards the water surface. Dead roots at the bottom with sunlight streaming in through an opening above. 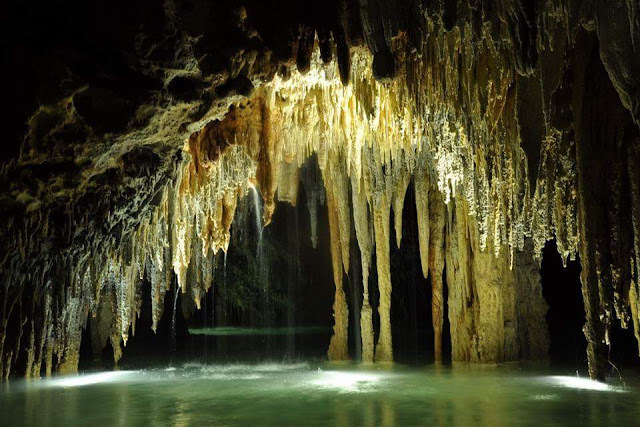 In otherwise total darkness, flashlights illuminate the stalactites. The final leg of the dive yielded more of the limestone formations we had been seeing earlier. It all went smoothly and I began to feel much more secure with this type of diving. My take from the dive was that this type of a dive is not suitable for all divers. And even though I felt that it enhanced my diving skills, it's not something I likely will repeat. Open water dives, with sea life and coral formations are simply more to my liking. But I did enjoy the challenge and the opportunity to dive the cenote.